It should not be surprising that the greatest defender in the world, comes from the land of the greatest defense, Italy. And thus, the greatest defender naturally would come from the dominant team, our beloved Vecchia Signora. Like many of Juventus Legends, Gaetano Scirea was plucked from his youth side, Atalanta at the young age of 21. He made an immediate impact on the side, and alongside one of the meanest stoppers of all time, Claudio Gentile, the duo would form one of the world’s greatest defenses in front of Dino Zoff. With the other defenders, Cabrini, Cuccureddu, and Brio, the group dominated Italy for much of the 1970s. It was in this time that the Bianconeri added the first star to the jersey, and accumulated Scudetto after Scudetto under the management of il Trap. The team would also form the backbone of the 1982 World Cup winning side. Scirea was a special kind of player. I would not seek to dismiss the prowress of Gentile, or the brilliance of left-back Cabrini, or the intelligence required for the defensive midfielder Beppe Furino. But his position required a special kind of genius. Scirea played as a sweeper, a libero in Italian, during the position’s transition from its’ catenaccio origins to one of a fulcrum of the squad. As a sweeper, he naturally would roam the defense and anticipate plays, breaking them up and distributing the ball, sort of as a deeper defensive midfielder. But this was only part of his responsibility. A sweeper had evolved from a defender to a playmaker. 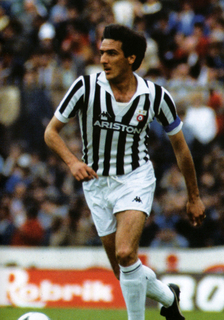 Often Scirea had the directive to build up play from the back, as well as pushing forward in attack. That explains, as a central-defender, his excellent goalscoring record over his 14-year career at Juventus. Scirea had a very intelligent role to play with the Bianconeri, especially given the fact that he was neither particularly pacey nor physically strong, and he played the Bianconeri tune beautifully. Gaetano was an elegant defender, blessed by his god-given ability to intelligently read the offense, anticipate play, and then quickly start a counter-attack by pushing forward whether dribbling like a striker or passing out wide to a midfielder. He was, in many ways, the opposite of his partner Claudio Gentile, he was a “gentleman sweeper” who rarely committed fouls due to his calm temperament and innate technical ability, never receiving a red-card his entire career, despite often playing as the last man in defense. His performances on the pitch mirrored his personality; never one to seek the limelight, he shied away from the media for much of his career. Shouldn't defense and response be swapped? I've got the impression that it was his exceptional ability to read the game as well as his positional play that made him such an outstanding defender rather than his reflexes, for example at min. 3:44, 3:58, 4:10 in this video, https://www.youtube.com/watch?v=jekIr2ncOqg, and 0:27 in this video: https://www.youtube.com/watch?v=irKmvdc ... re=related.